Summer is upon us and observing the summer Milky Way is one of the simple joys for night sky enthusiasts. Find out what other sights await you on a clear summer night. The Summer Triangle dominates the summer sky. It crosses the hazy band of the Milky Way, which is split into two near the star Deneb by a large dust cloud called the Cygnus Rift. The points of the triangle are three of the brightest stars in the summer sky, each the brightest star in its own constellation. The brightest is Vega, in Lyra; second is Altair, in Aquila; and third is Deneb, in Cygnus. Even city-dwellers with glowing, light-polluted skies can find the Summer Triangle. Using the Big Dipper as the guide to the other stars and constellations, imagine a line extending 75 degrees of sky from the two bowl stars closest to the handle, to a point in the middle of the Summer Triangle. Stretch out your arm out at full length and measure about three spread hands from little finger to thumb. Each hand covers about 25 degrees of sky. Vega is the brightest star in the triangle and is almost directly overhead in the summer. Contrary to what you might have seen in the movie Contact, no signs of an extraterrestrial civilization have been detected around this hot star—at least not yet. The name Vega comes from the Arabic word meaning swooping eagle or vulture. Vega is the luminary of Lyra, the Harp, a small but prominent constellation that is home to the Ring Nebula and the star Epsilon Lyrae. In mythology, Orpheus led Eurydice back from the underworld by charming the guards of the underworld with the music of his harp. The Ring Nebula is a luminous shell of gas that was ejected from an old star. It resembles a smoke ring or doughnut. Epsilon Lyrae appears to the naked eye as a double star, but through a small telescope you can see that the two individual stars are themselves double! Epsilon Lyrae is popularly known as the "double double." Vega is a hydrogen-burning dwarf star, 54 times as luminous and 1.5 times as massive as the sun. It's relatively close to us, 25 light-years away. Once you have found Vega, look down to the south-southeast and you will see Altair in the constellation Aquila (the Eagle). Altair spins at an amazing 750,000 kilometers (470,000 miles) per hour. This rotation has stretched Altair into an egg shape, wider than it is tall. Altair is one of our nearest neighbors, 16 light-years away. The most prominent constellation that forms part of the Summer Triangle is Cygnus. The main stars in Cygnus create a pattern in the sky known as the Northern Cross, with Deneb at the top. Cygnus is in an area of the Milky Way that contains many objects easily seen with an amateur telescope, including a beautiful red and blue double star at the base of the cross, Albireo. Imagine drawing a line from Phecda, the star on the bottom of the bowl of the Big Dipper closest to the handle, and continuing through Mizar, the star at the bend of the handle. It will pass by the constellation Hercules. Using Mizar as your starting point, stretch your arm out at full length and measure about two spread hands from little finger to thumb. Hercules is an ancient and faint constellation devoid of bright stars, such as those forming the Summer Triangle. Four of its main stars form a trapezoidal asterism called "the Keystone." 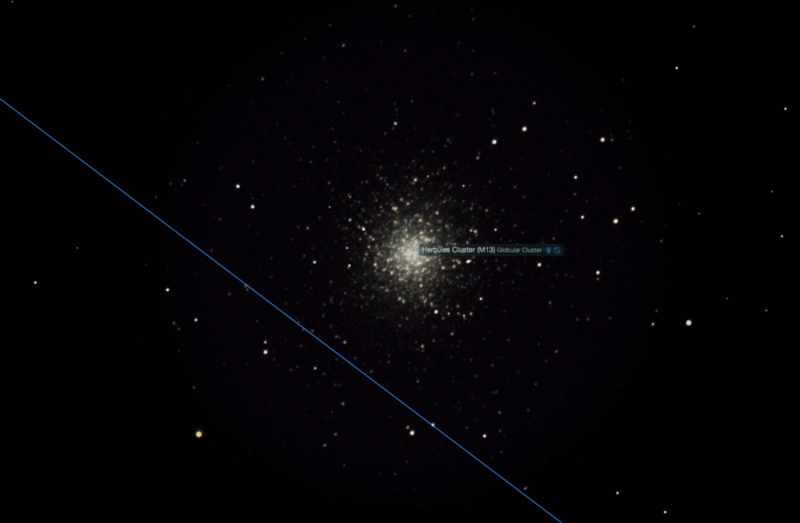 On one side of the Keystone is a beautiful globular cluster—a stellar ball containing several hundred thousand stars. The Hercules cluster—also named Messier 13 or simply M13—is one of the sky's most beautiful sights and the finest globular cluster in the Northern Hemisphere. It is visible with the unaided eye by observers far removed from a city's glow. In binoculars, M13 looks like a fuzzy star; it's one of the more spectacular objects in the sky when seen through a telescope. Edmond Halley, better known for predicting the return of the comet that still bears his name, discovered the Hercules Cluster. M13 was selected as a target for one of the first radio messages broadcast to extraterrestrials from the Arecibo Observatory in Puerto Rico. If alien civilizations exist in the Great Hercules Cluster, we won't receive their reply for 50,000 years, because M13 is 25,000 light-years from Earth. Summer nights offer the best time to explore our own Milky Way, a ribbon of pale light, formed by the combined light of billions of stars, that in summer stretches across the entire sky from northeast to southwest. As summer comes on, the view gets exciting. We are treated to glowing clouds of dust, dark rifts, and star clusters as we look at our galaxy edge-on. Think of it as a flattened pancake of stars, seen on its edge. The Milky Way is one of the most remarkable naked-eye sights in good dark skies far removed from the bright glows of civilization. You should be able to see the Cygnus Rift, a dark lane in the Milky Way between the constellations Cygnus and Scutum. The Cygnus Rift is not a hole in the Milky Way but rather a cloud of dust that obscures the view of distant stars. Scanning with binoculars unveils the misty band of the Milky Way and reveals a sparkling river of thousands of stars. The most interesting regions stretch from the Summer Triangle toward the south-southeastern horizon.